THE ART OF THE LIE OR THE LIE AS ART? -lie. 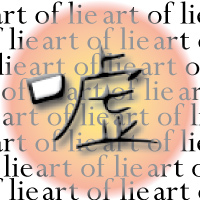 (lai) n. – an intentionally false statement or impression. A purposeful deception. Any creative endeavor…painting, song writing, poetry or the fabrication of a story, harkens to a certain fiction, a deception; an attempt to provide the reader or viewer with an illusory experience. Therefore, one manner in which to approach writing fiction is to view it as essentially the art of relating a lie; an elaborate, contrived whopper at the least, an artistic pretense at best. When I came across this passage. I marveled at Laing’s insight into such a universal human experience ̶ the territory of ourselves, and also the manner in which a simple deceit, a secret, can create and define that territory. At the time I came across this quote I was conjuring up the history and personalities of the characters in my novel STILL LIFE IN A RED DRESS, and I realized at the core of my story was the abundance of secrets.
. We deceive and keep secrets for many reasons ̶ to protect ourselves, to protect others, or one lies because they are a sociopath or the president, Just because one can. We lie out of weakness and strength. We lie and keep things from our friends, our enemies, our partners, our children, the IRS, and all too often we lie to ourselves. No doubt, the best of us have lied on one occasion or another. White lies, black lies. At the least, we have secrets, unspoken lies. I suspect for some of us at certain times a lie is nothing more than an evasion that allows us to retreat into a territory all our own, a place for secrets that never have to be shared. Many of my characters lie or have secrets. They lie to avoid facing up to truths. They lie to protect. They lie to deceive an enemy. In Still Life In A Red Dress the character Ray lies because he is unable to face his own culpability in the death of his friend Sonny’s lover and thus feels the truth will destroy his friendship. The character Aminta lives a life of duplicity. Her survival depends on secrets. She lies out of love for her country even though it costs her the love of a man. Lying always has costs. None of my stories are based on actual occurrences in my life. However, a good lie always contains a bit of truth which makes the fiction of the lie more credible. Thus, the flip side of writing fiction lies in the existential, both personal and the observed. All of my stories emanate either from real events, historical or current, or the lives of actual people. Many of my characters’ motivations owe as much to my imagination as to what these real people might do in a particular situation. Many of my settings ̶ hotel rooms, bars, beaches, houses ̶ are actual locales based upon my memories and experiences. The creation of an imagined world requires some degree of detail and an illusion of reality in order to transport the reader to a place, a situation or to elicit an emotion – the elaborate, believable lie. And by way of creating that lie I create a territory of my own, and if shared well, a territory for the reader. As to whether I accomplish this, I leave that to you, the reader. That being said, I always welcome comments and critiques from my readers. Is it coincidence that February, the month of romance, is closely followed by March, which is named after Mars, the Roman god of war? I don’t think so. Each human generation has its loves, its wars, and its authors who write about both. My war was Korea, therefore,it seems fitting that one of my favorite authors should be James Michener, who wrote Sayonara and The Bridges of Toko-Ri, both sweeping tales about forbidden love set in the Korean conflict, the war of the Silent Generation. If your generation’s war was the Nicaraguan Civil War and you enjoy intricate plots that involve the deepest of human emotions, betrayal, redemption, and a quest, you might like STILL LIFE IN A RED DRESS by DENNIS JUNG. Set during another war most people don’t talk about, a war fought in secret by the CIA, STILL LIFE IN A RED DRESS is a story of love, much like Sayonara, that also involves the guilt of a forbidden and secret affair, the death of a beautiful and patriotic woman, and her lover’s attempts to find her and ease the guilt of their betrayal. Dennis Jung is a talented author, his style reminiscent of Michener’s, and his novel’s scope and depth wider and more contemporary. Why not give STILL LIFE IN A RED DRESS, available in paperback and Ebook, a try and see where it takes you?